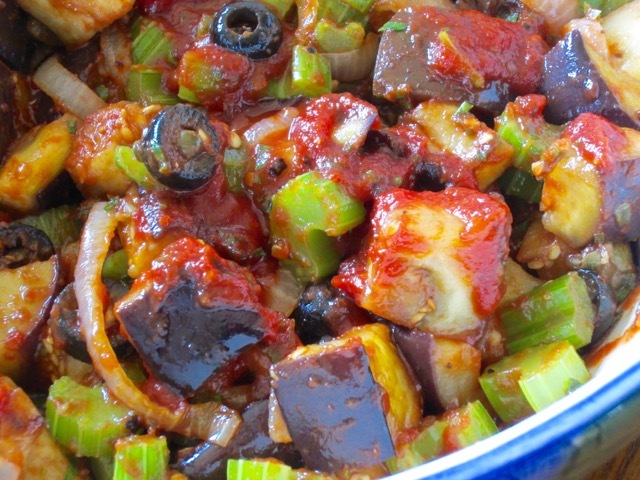 There are many caponata recipes out there but this one drew my undivided attention and I wanted to taste it, so I made it. I used anchovies as directed in the recipe and so everybody in my house politely declined to eat the caponata. They claim anchovies have this horrible fishy smell but frankly speaking, I didn’t taste anything fishy by the time it was ready for eating. Anyway as this recipe is supposed to serve 4-6 people you can imagine my dilemma. First I grilled some slices of bread with olive oil and heaped them with lots of caponata and that was my breakfast, yesterday. Lunch time, I had some alongside my plate of Romano Bean Rice. Last night I had it with some fresh ricotta cheese. Thankfully I’ve gone through 5 servings and now I have only one more serving to go (LOL). Next time I shall half this recipe since my numerous attempts to cajole and convince others to eat fell on deaf ears. I wish you a lovely day and if you don’t care much for anchovies just omit them. 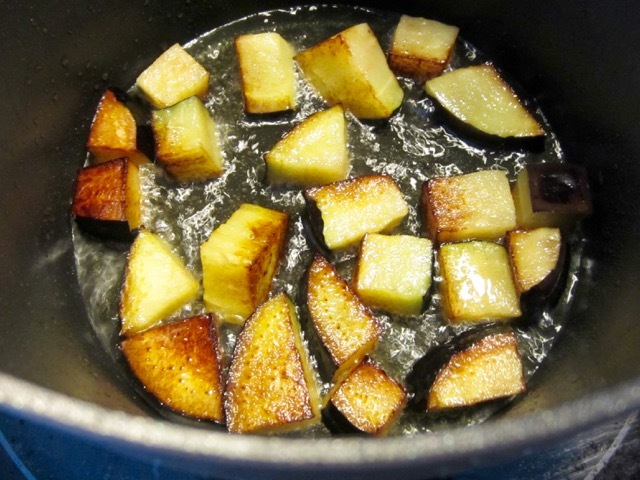 In a medium sized pot, heat 2cm (3/4 inch) vegetable oil and fry the eggplant in batches, turning occasionally, until browned on all sides. Remove with a slotted spoon and drain on a plate lined with paper towels. Season with salt. 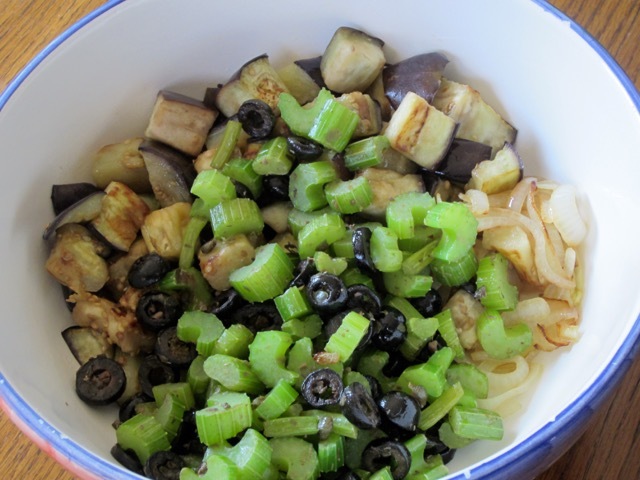 Brown the onions in olive oil, drain and set aside then sauté the celery, anchovies, capers and olives in oil for a few minutes then set aside. 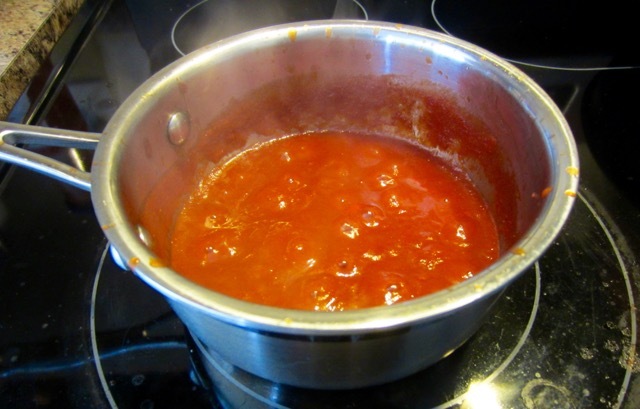 To make tomato sauce: heat the tomato passata with the sugar and simmer, uncovered, until well reduced and darker in colour. Add the vinegar and continue simmering for another 5-8 minutes. Season with salt and pepper, add chopped parsley and remove from heat. add the sauce and mix thoroughly to combine. Allow to cool and serve. Plunge the celery in lightly salted boiling water, then let simmer gently, 5-7 minutes, until crisp-tender then drain and place on an absorbent paper towel. Brown the onions in olive oil, drain and set aside. 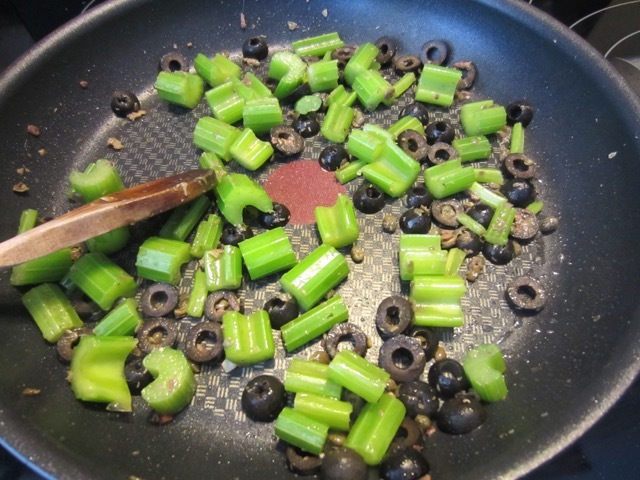 In the same pan, sauté the celery, anchovies, capers and olives in olive oil for a few minutes then set aside. 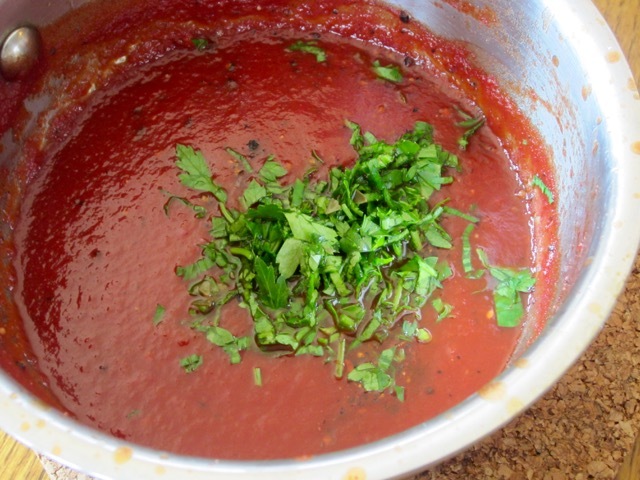 To make tomato sauce: heat the tomato passata with the sugar and simmer, uncovered, until well reduced and darker in colour. Add the vinegar and continue simmering for another 5-8 minutes. Season with salt and pepper, add chopped parsley and remove from heat. Mix all the other ingredients in a bowl, add the sauce and mix thoroughly to combine. Allow to cool and serve. 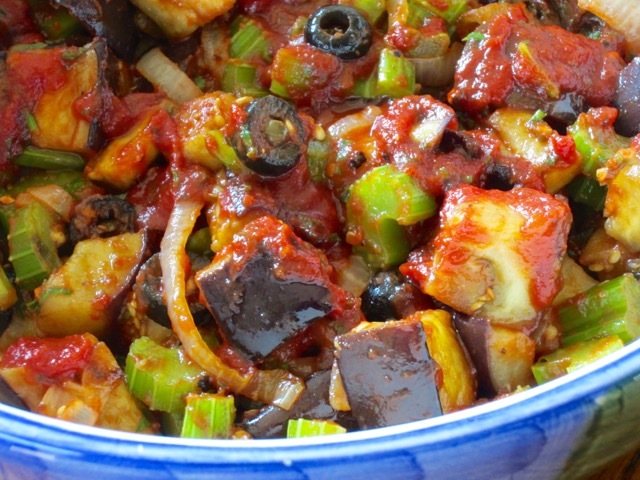 You can keep the caponata in the fridge and let the flavours meld and serve it the next day. It tastes so much better, the next day! Prev What are Strained Tomatoes? I know, Kat. I spent so much time and effort. And there was nothing fishy about it. I opened my big mouth…if I hadn’t said anything they wouldn’t have noticed nothing!!! It tasted awesome. I’m making some tomorrow! This looks Great! I will have to make it with the anchovies! They are like using fish sauce it stinks but it adds the umami to round out the taste. Yummy! 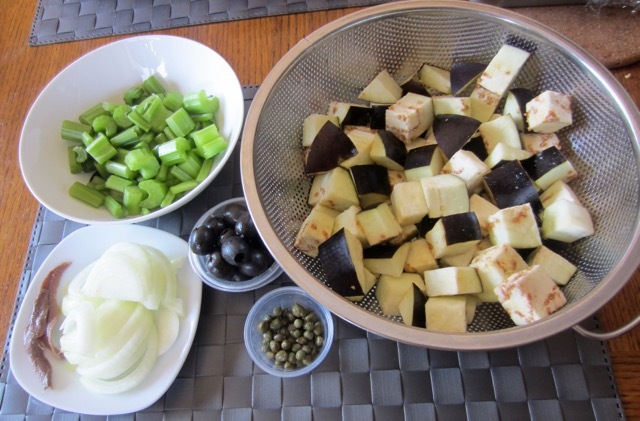 I honestly smelled it during chopping but once the caponata was ready, I could not smell the raw smell anymore. It was so good! I am planning to make it, again!